The NARL President, Werner Muller (V51JP), visited Germany during the Namibia holiday season. One of the highlights of his visit was at the Deutscher Amateur-Radio-Club (DARC) HQ and the DARC QSL bureau. The first Award went to Martin DL1ZU (V51ZU) who was his host for the first week of stay. During his stay Martin organized a lot of very interesting meet ups and visits to exciting places. The second award was handed to Ralf Schiffner (DK8FA). The award was admired by all and I had a lot of very interesting conversations with the Amateurs present. A big thank you to Martin DL1ZU (V51ZU) for the time and effort he put in to host Werner and to show him around. The Gamsberg repeater was fixed on Saturday 04 August 2018. Robert (V51RS), Werner (V51JP) and Olaf (V51OB) drove the gravel road to the Gamsberg in the early morning to be joined by Friedhelm (V51FH) from his farm near Gamsberg. The team arrived safely at the Gamsberg in spite of a close encounter with a Kudu running over the road. The reason for the broken repeater was quickly discovered. The repeater radio was broken and was replaced. Olaf (V51OB) decided to climb the tower, in spite of the cold windy conditions, to tie some of the loose cables running up the towers. 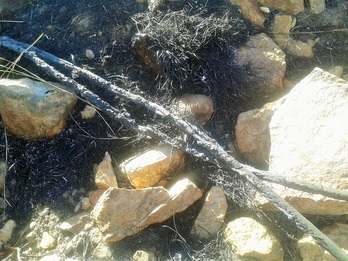 It turned out to be the cables from the repeater of the farmers in the area. HAM radio is also about service to the community and the cables were tied back onto the tower. The outing was also a good opportunity to activate the JG86 grid for anyone chasing grids for the V5WAGS award. Lots of contacts from South Africa were made. More information about the V5WAGS award can be found here. The NARL celebrated World Amateur Radio Day (WARD) with an interview on a local Namibian FM radio station, Hit Radio Namibia. The show featured Werner (V51JP) as well as a real HF QSO from Mike (V51MA). Russell (V51RJ) manned the Shark Island Lighthouse on 19 and 20 August 2017. Weather was fine, no wind. He had a successful and enjoyable weekend although the propagation was not that good. Majority of contacts were South African stations. A total of 85 regional and 1 DX (Argentina on 40m) contacts were made. Russell reported that he was surprised to see the performance of his 80m wire antenna. It was 85ft long with 17ft counterpoise at 3m above ground. Had a good NVIS effect, signal 5/9 with 100W. Maybe the island also had good effect on radio waves. The Windhoek repeater's output site was right in the line of fire during a thunderstorm in late October 2015. The feeder wires to the 2m and 70 cm antennas was damaged beyond repair. Luckily there were a second pair of antennas on site with a pair of un-damaged feeder wires. After a swop of cables the repeater was online again. Another trip to the repeater site is scheduled to replace the damaged cables with new ones. The special call sign V55HQ was again gladly heard by many amateur radio stations worldwide during the 24 hour contest weekend on July 11th to 12th, 2015. This event could take place on the farm Otjikoko near Omaruru thanks to the hospitality and support of Martin Walter (V51W) and Ursi. 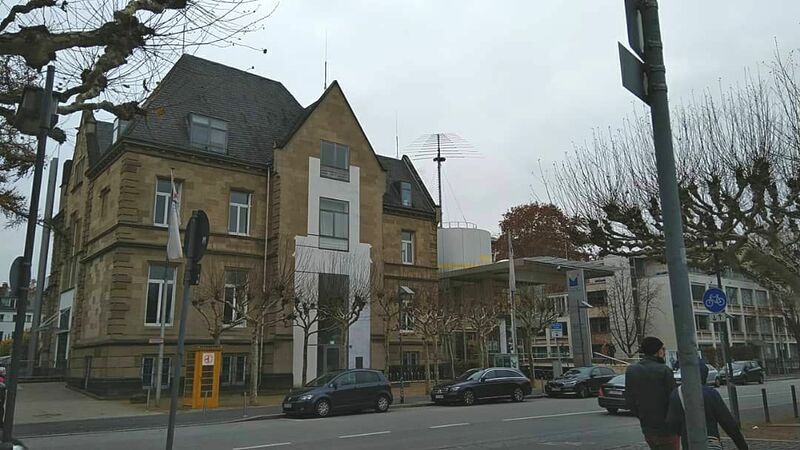 A big group of German radio amateurs supported the preparation and realisation of this event for more than one week by setting up new antennas, revising the existent equipment and installing the radio stations. Three stations were set up for voice communication (SSB) and three others for telegraphy (CW) at different locations of the farm area. A computer network allowed the electronic logging of all contacts and the up to date information exchange of the made contacts. The radio conditions were worse than in 2014, nevertheless the number of radio contacts increased during the 24 hour period. Seventeen radio operators from Namibia and Germany took part in the event which ended up in about 7300 contacts. The placing in the world wide rank list cannot be foreseen up to now because the evaluation of all worldwide submitted log-files to the organiser, the American Radio League (ARRL) takes a few months. The crew does not want to forget to thank also the NARL and the CRAN authority for the uncomplicated granting of guest licences for the German operators who were greatly supported by Klaus Wesche (V51L) in the paper work. The Swakopmund repeater was installed in 2014. Derek (V51DM) has assembled a repeater system for the coast and together with Robert (V51RS) it was tied into the Windhoek repeater via the Gamsberg link. The Repeater system has a huge footprint and can be accessed from as far as Hentiesbaai and Solitaire. Frequency is 145.750 (RX) and 145.150 (TX) with 88.5Hz CTCSS tone. 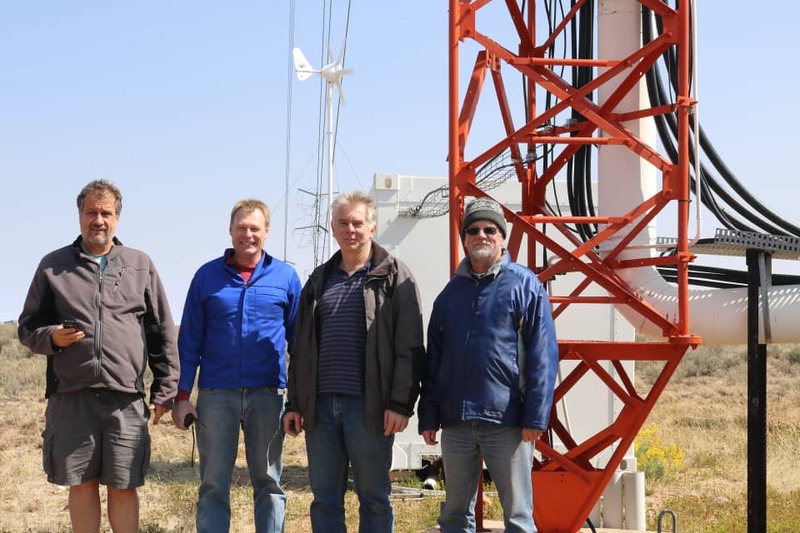 Robert (V51RS) made a trip to the Gamsberg and was joined by Friedhelm (V51FH) to upgrade the Gamsberg Repeater. The new Gamsberg repeater frequencies are: Rx 145.150 Mhz and Tx 145.750MHz with a 88.5 Hz CTCSS tone. The reason for this change are to enable the Gamsberg repeater to act as a link for the proposed Swakopmund repeater. The 70cm Yagi antenna is pointing towards the Windhoek repeater and the 2m antenna is a dipole. To test the operation of the repeaters range, regular contact are made in the evenings between Raymond (V51RAY) and Robert (V51RS). Raymond is situated in Walvisbay (180km from the Gamsberg) and is using a J-Pole antenna 10m above ground level. The distance from Gamsberg to the Windhoek repeater is about 120km. 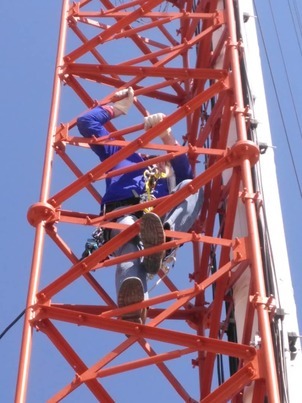 We would like to express our thanks to Friedhelm (V51FH) for assisting Robert with the upgrading of the Gamsberg repeater. The battery sponsored by Electro Tech was also installed during the upgrade. The original Gamsberg repeater was installed in 2012 by Martin (V51/DL1ZU), Friedhelm (V51FH) and Robert. Edit: 13 February 2015 - Corrected Gamsberg Frequencies. Namibia participated for the first time in the IARU HQ contest. This contest was open to all IARU member societies and Martin (V51W) and Klaus (V51L), with the blessing of the NARL have successfully applied for the contest call sign V55HQ. The official NARL HQ station was hosted on Martins' Farm on the weekend of 12 and 13 July 2014. See the IARU HF Championship page for more details. The Großer Marsch ("Big Walk") of the Delta School was a big success and Council wishes to thank Peter (V51BP), Friedhelm (V51FH), George (V51GU) and Victor (V51V) for their help. Thank you also to Juergen (V51JF) who manned the tent like in previous years and Robert (V51RS) and Angela (V51SA) for organising the radios, batteries and food. We had a lot of fun and hope that we can count on everyone again next year. Robert (V51RS) assembled the emergency repeater and it was tested extensively at the Großer Marsch on Saturday. We are happy to report that the emergency repeater is functioning flawless. George (V51GU) was able to secure the sponsorship of a new battery for the Gamsberg repeater. The NARL would herewith like to thank Electro Tech for the kind sponsorship and George for organising this. Our youngest member is Sylvia Schenk (V51YL). She obtained her radio amateur license in 2010 at age 14. 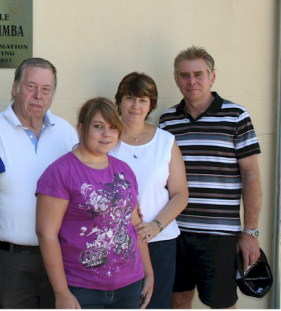 Seen here with father, mother and grandfather who are also active radio amateurs. 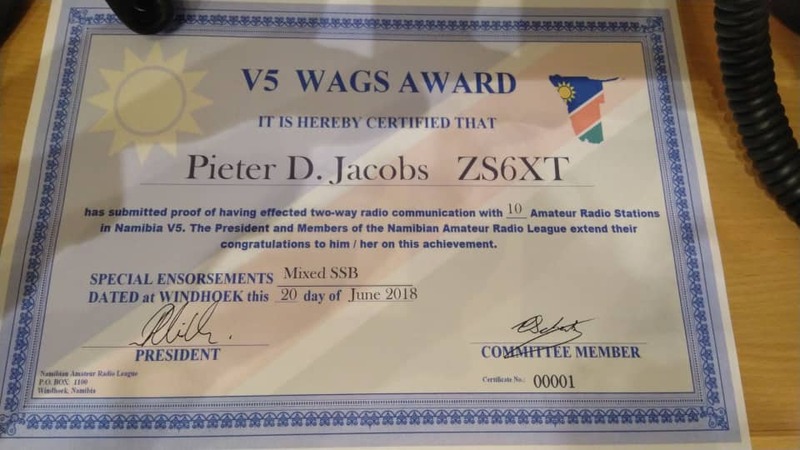 The South African Radio League (SARL) is reaching out to radio amateurs who are members of their national society in SADC countries, to join the SARL on a complimentary basis. This is part of the SARL's commitment to support the IARU Region 1 "Support for the Amateur Radio Service" or, for short, STARS programme. The objective of the STARS programme is to defend, protect, extend, develop and promote the amateur radio service in countries where amateur radio activity is low or nonexistent. To apply, radio amateurs in Namibia should complete the SARL membership application form and submit the form to me so the NARL can forward it with the proof of membership to the SARL. All repeaters are up and running. (NEW) The Gamsberg repeater has been fixed. Therefore the link to the Swakopmund repeater is now working again. Robert (V51RS) is currently researching and preparing a new repeater site on the Erongo mountain. The Windhoek repeater was damaged by a fire caused by lightning. It has been fixed by Robert (V51RS) , Guido (V51GK) and Fritz (V51WF). The Swakopmund repeater was installed in 2014. Frequency is 145.750 (RX) and 145.150 (TX) with 88.5Hz CTCSS tone. The Gamsberg Repeater frequency changed to 145.150 (RX) and 145.750 (TX) with 88.5Hz CTCSS tone. the Gamsberg link. It appears that the battery on Gamsberg has reached the end of its life and has to be replaced soon. D-Star repeater currently being tested in Windhoek. Its now running the latest software from G4KLX. See activity on http://xreflector.net/neu3/.